City streets, a winepress, pulleys, spinning tops, a ray fish, curdled milk: just a few of the many images used by 16th century anatomist Andreas Vesalius to explain the workings of the human body in his seminal work De Humani Corporis Fabrica. Marri Lynn explores. 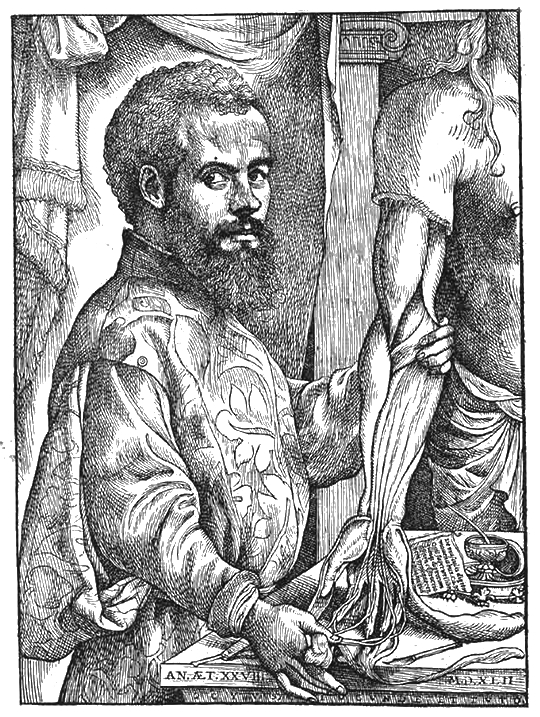 Portrait of Vesalius featured in De Humani Corporis Fabrica – Source. Andreas Vesalius threw down a glove in front of established medicine and its scholars when, in 1543, he produced a massive anatomy text titled De Humani Corporis Fabrica — on the fabric of the human body. Vesalius believed that the field of medicine was being ill served by sending its students to books to learn their anatomy. The flesh itself had to teach, not merely the page. This idea of hands-on learning trumping an ancient textual legacy was an affront to many of Vesalius’ medical peers. Medicine was not a handicraft, but a noble scholastic art. Far from trying to disparage his discipline, Vesalius intended to elevate the most denigrated field of medicine – surgery – to that same level of esteem. He was taking a professional risk. But the Fabrica, the result of untold hours of dissection and writing, largely spoke persuasively for itself. Vesalius exposed hundreds of mistakes made by Galen, whose writings were still considered the chief source on anatomy over a thousand years after they had been written. Naturally, there were some who still believed that Vesalius had misunderstood what he had seen in his dissections, or Galen’s explanation itself. But the stance the Fabrica and its author took gained attention, and the idea of an apprenticeship in anatomy at the slab, rather than the desk, began to gain ground. 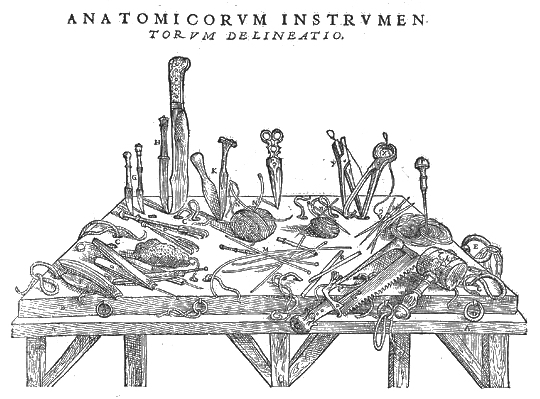 Illustration showing the tools of Vesalius’ trade, from the “studio of Titian” featured in De Humani Corporis Fabrica – Source. Still, opportunities for students to actually observe dissections were rarer than Vesalius would like, and could never fill the need of a student or professional to occasionally fact-check their memory, or consult a confusing realm of the body in more depth at their leisure. 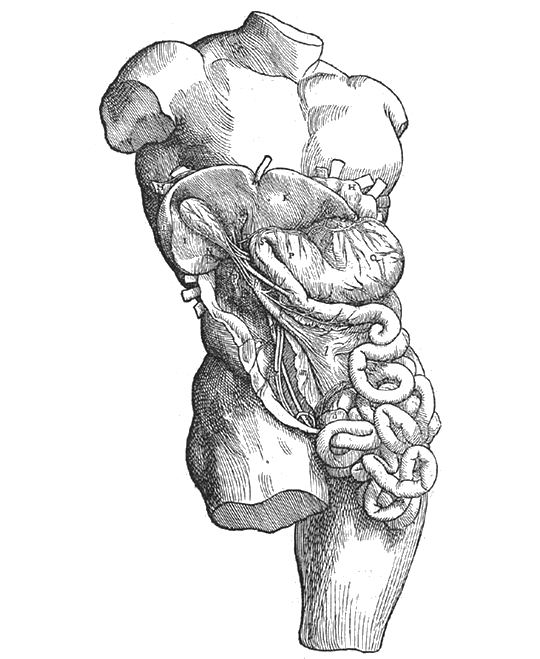 The Fabrica‘s illustrations were a small effort to reproduce, for the study, the complexity that would confront the anatomy student in the anatomy theatre. The resulting woodcut illustrations, beautiful works prepared at Vesalius’ own expense in Titian’s Venetian workshop, have become the centerpiece of the Fabrica’s lasting impression. But it is telling that Vesalius had his Latin text published in German only days afterward. The Fabrica was meant to be read, and read again — not merely looked at. This was all the more true for the students of anatomy Vesalius wanted to reach out to, who would be buying abbreviated versions of the massive text, without nearly as many (if any) expensive illustrations reproduced inside. And furthermore, two-dimensional images could never properly convey the constant movement and form of a three-dimensional body. Vesalius had to, as best as he was able, paint a moving mental picture with words that would be good enough for surgeons to use as guidance when they lowered their blade into the flesh of their patients. Illustration from the “studio of Titian” featured in De Humani Corporis Fabrica – Source. To draw the reader’s mind toward a mental model of the body’s inner workings, Vesalius used his full toolkit of pedagogic devices. Metaphor and analogy, especially, could be used to help the student make the cognitive leap to understanding the alien. Now, these metaphors show us the ways in which anatomists might visualize and understand the structures, dynamic processes, and physical motions of the body. While he broke with tradition in many ways, Vesalius’ use of metaphor was in fact a continuation of a stylistic and polemic tradition. Metaphor had been used by earlier writers, and in some cases, Vesalius drew from their dictionary of established comparisons directly. Since many of the structures Vesalius encountered did not yet have proper names, using creative analogues as visual signposts and descriptions of function was still a natural solution. With the intention that both elites and humble students would read his work, he carefully chose accessible symbols as his objects of comparison. His metaphors reveal not only the state of anatomical knowledge of the time, but realms of shared experience. Many of the metaphors used in the Fabrica could have been written today. Vesalius sees the veins and arteries like a pipe, synovial fluid like oil, and the skeleton like the walls and supportive beams of a house. 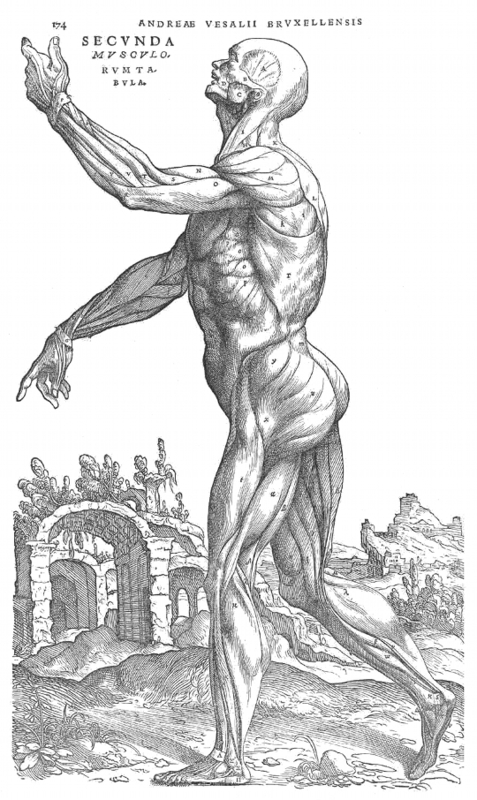 His mechanical metaphors strike one as especially current to our post-industrial way of thinking, but Vesalius’ conception of the body as a whole formed by moving parts placed man’s engines and inventions in imitation of Nature, and not the other way around. To describe muscles, he draws upon the images of a spinning top, a ray fish, a pyramid, the letter C, a butcher’s cleaver, and Benedictine cowls. Horns, nets, rivers, pumpkin vines, pigeon coops, wickerwork baskets full of curdled milk, grape root, and tree trunks shelter elsewhere in the anatomy, somehow envisioned amidst what must have appeared, to the untrained eye, as a bloody mess beneath the scalpel. Amidst lengthy, precise descriptions, these metaphors are bursts of color and clarity, never mixed or muddled even when presented in close proximity. As a Latin stylist, Vesalius was far from florid, making his choices of imagery interesting in their individual precision, contrasted with their overall diversity across the pages. A modern translation of the Fabrica from Latin to English, in its entirety, has revealed the full breadth of the author’s attention to detail, as well as his clarity in describing anatomical structures which still puzzle and entrance new students of anatomy to this day. 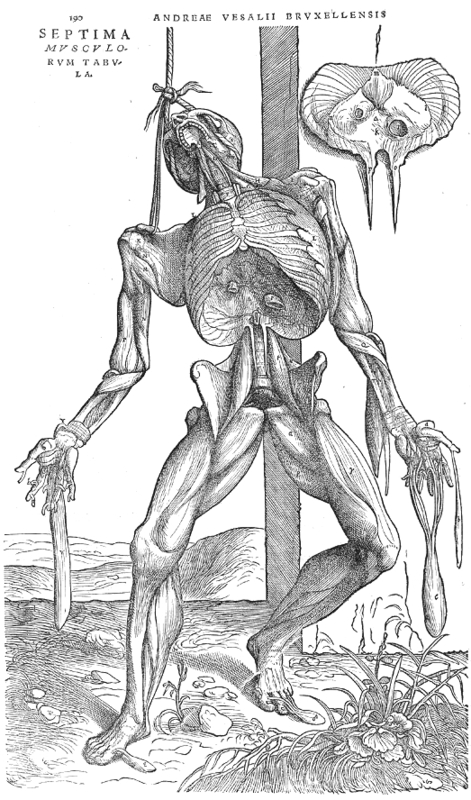 Jacob Soll has suggested that Vesalius’ manner of making the body more complex while at once demystifying it “changed the nature of corporeal metaphor.” The recent discovery of his own annotated copy of the Fabrica suggests that Vesalius continued to think about his choice of words well after publication. Whatever his qualms with the minutiae of his legacy, the Fabrica remains a work that struck the imaginative faculties and changed the practice of anatomy generations before technology would penetrate the flesh and render it truly visible in three dimensions. Marri Lynn holds a BA in History from the University of Victoria, and an MA in the History of Medicine from McGill University. You can find her at: http://about.me/marri.lynn.